Christmas Eve is around the corner. While you'll have to wait for your presents a few more days, we hand off our gifts to you early: starting today at 10am CET, you will be able to find the last gift in the Expeditions. Another supreme card is waiting to be claimed. And while Christmas is about the family mostly, it's also about buddies. 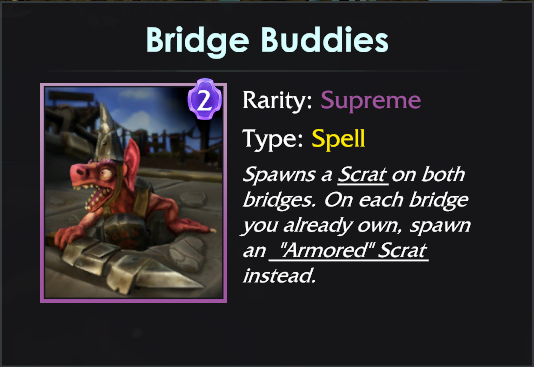 In that case, Bridge Buddies. The Frostival will continue until January 3rd 2018. Another week ends, you're reading the Community Happenings and that can only mean a new Deck of the Week has been chosen. This week, a well known Master from Germany will be - hopefully - happy to see his deck featured here. "ecke", that's how most of you know him in-game, is also known as the Angry Snail. This comes partially from his other alias "Graf Schnecke" which means Count/Lord Snail in English. The other part was created by Dipshit live on stream, since ecke lost a game and stomped his opponent afterwards. Dipshit therefore concluded, that the snail got angry. Its a low skill Cap but honorful Deck. How to play it? First you need to play some epic Sabaton tracks to get in the right mood. Then you select Sergeant Settsu. Your main strategy is to pressure your opponent with an all in attack where you dont give a crap about the enemy units attacking you and even jumping in with Settsu (because attacking is the best defense, thats what the snails grandpa said). If you launch an attack with Cleaver prepare Daggerfall, Shock Rock and even Beam of Doom to counter counters such as Musketeer or swarm units. With Dragon Welp, Scrat Horde and Musketeer you have a pretty solid defense with lots of damage, which can sometimes turn into a great offensive push. But instead of defending immediately (when lonely enemy tanks appear) you try to counter push and just ignore the incoming damage for a while. Why do I play it like this? Because you can easily take the damage like a man... or more like a snail to the face with the defense units. With the Illusiory Cleaver you can try to bait out spells to pretend it's a real Cleaver. If yoiu enemy doesn't get tricked by that, you just don't care and use it as cycle card or against swarm. With your spells you want to always predict the obvious enemy counters and have them ready to smash the face and also get some juicy Settsu reloads. Plasma Marines just do their general job in either defending or attacking. But there should never be 4 of them clustered, if the enemy still has a potential Daggerfall. I know Settsu is female, but we snails do not care a lot about gender since our actions determine it. 2017 was an amazing year for us. We had a blast working with you, an amazing community! And when we look into the future, 2018 will be truly legendary. To prepare you for the new year, we will reveal changes over the course of the next blog posts, starting at Monday, December 25th. We will talk about Expedition reworks, weekly events and more. Stay tuned, be prepared! By the way: Minion Masters, Minion Masters Premium Upgrade, FORCED, FORCED Showdown and all related DLCs are on sale! Cheers and Merry Christmas from BetaDwarf!